Decades after the war with America ended, Vietnamese families continue to search for the remains of their kin who are still missing in action. On July 27, the day a collection of remains believed to be those of American soldiers lost in the Korean War were flown out of North Korea, I was driving from Hanoi to Vietnam’s rural northern province of Yen Bai. My host that morning was Ngo Thuy Hang, the 42-year-old vice director of Marin, a local nonprofit devoted to helping Vietnamese families locate the remains of their loved ones. More than 300,000 Vietnamese soldiers are still missing from the war with America, a heartbreaking statistic that reverberates across thousands of Vietnamese families, mostly in the north. And though Vietnam’s government has made scattered efforts to search for remains, the resources devoted to finding the missing Vietnamese are a small fraction of those devoted to recovering the 1,600 Americans still listed as M.I.A. from the same war. Having a missing family member is particularly traumatic in Vietnam’s culture of ancestor worship, which dictates that if the dead aren’t found and buried along with other ancestors in their hometown, where relatives can pray and honor them, the dead person becomes a lost soul, wandering homeless and hungry, in a kind of permanent purgatory. We were headed to a small village outside of Yen Bai’s sleepy main town to visit Nguyen Thi Sinh, 96, who lost two sons in the war with America. In 2014 the government made her one of 40,000 Heroic Mothers of Vietnam, an official title given to “mothers who have made numerous contributions and sacrifices for the cause of national liberation,” the sacrifices being losing more than one son, losing an only son or losing one son and having another return wounded. The younger of Ms. Sinh’s two sons killed in the war, Binh, died in 1973 near the city of Hue; his body was recovered and buried in the family cemetery. Her older son, Ky, who reportedly died in 1968 in the southern-central province of Binh Dinh, is still missing. To the right of where we sat was a large, carved wood altar holding fruit and incense. On the wall above the altar hung pictures of Binh and Ky in military uniform. A volunteer from Ms. Hang’s group sitting next to Ms. Sinh took her hand and said the process took time, with a lot of old paperwork to sort through and people to contact. Back in Hanoi, Ms. Hang runs Marin from a two-bedroom apartment in a leaky building on the city’s outskirts. The apartment doubles as her home. Marin is financed by small, individual donations and operates on an annual budget of about $10,000. The day before, the scene in the apartment’s front room had been chaotic. Relatives of missing soldiers crowded the doorway, waiting their turn to consult with Ms. Hang. She sat in front of a laptop at a desk near the kitchen, tending alternately to the visitors’ requests for help and others that came to her two cellphones. “You need to call the local military office in Ninh Thuan province and find out where and how he was killed,” she told a caller who was looking for his uncle. After 15 years of helping families track down missing soldiers, Ms. Hang has become an expert on the minutiae of military records and arcane government paperwork. The families seeking her help usually have little more information than that on the official death notice — name, birth date, enlistment date, date and place of death (which is often recorded simply as “The Southern front”). For many families, Ms. Hang is their only hope. Since the fighting between Americans and Vietnamese ended in 1975, the Vietnamese government has taken some steps to recover the bodies. Shortly after the war ended, official remains-gathering teams traveled to the central provinces, to the sites of some of the worst battles, to dig up hastily buried or abandoned soldiers. The task of identifying the remains was complicated by the brutal nature of the war; the artillery used by Americans and their Southern Vietnamese allies was so powerful it often obliterated everything in its path. Even when the search teams found a corpse or a set of bones, identification was difficult because North Vietnamese soldiers weren’t issued dog tags as their American and South Vietnamese counterparts were. Today Vietnam is one of the world’s fastest-growing economies. But the end of the war ushered in two decades of intense poverty, thanks largely to American economic sanctions, part of a broader set of policies that were a way short of combat for America to continue to wage war on Vietnam. As a result, in those decades neither the Vietnamese government nor individual families had spare resources to devote to finding the missing. It wasn’t until the early 2000s, when Vietnam’s economic situation had improved after market reforms in the 1990s, that families began to search in earnest for their missing loved ones. In overwhelmingly self-financed efforts, they pooled resources and began to travel from the north to the central provinces to search for the bodies of relatives. Though the Vietnamese government has made overtures of support for gathering and identifying remains, its efforts continue to be mostly limited and often inept, according to volunteers and families with whom I spoke. 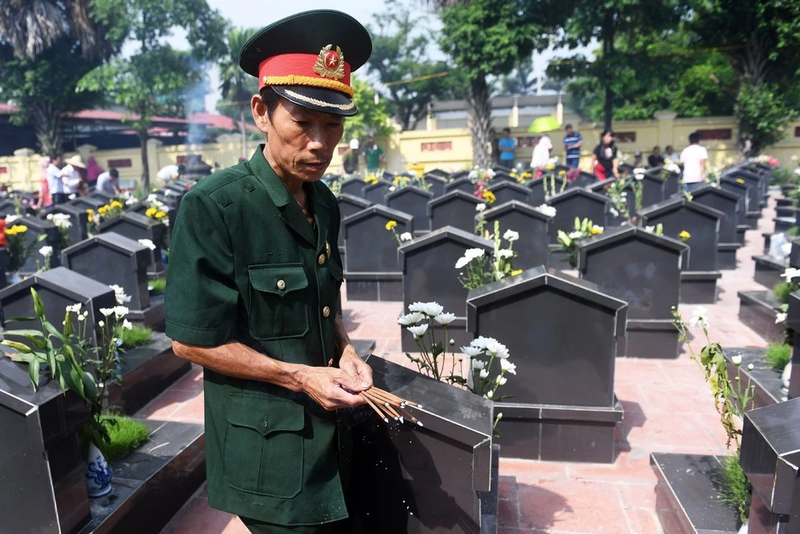 The Vietnamese government has focused its search efforts mostly on mass graves and offers help only to families who already know the exact place where their loved one died. The thousands and thousands of other families who don’t have this information are on their own. In 2014, the Vietnamese government announced that it would invest about $25 million in a huge DNA identification project — a joint venture with a German biotech firm named Bioglobe. But little has been done so far. “They say they’re building something, but we never know,” the woman who was still looking for her uncle said, adding that she assumes any funds actually set aside for identifying remains would just end up in the pockets of corrupt government officials. The United States spends about $100 million annually on efforts to find its own 1,597 service members who are listed as missing in Southeast Asia. Since 1991, the United States has maintained an office in Hanoi dedicated to finding its missing; today it operates as an outpost of the Defense P.O.W./M.I.A. Accounting Agency on Tran Phu, one of downtown Hanoi’s most beautiful leafy streets. In the Vietnamese government, there is no similarly centralized office devoted to finding the missing Vietnamese soldiers. There is, though, a centralized government office devoted to finding missing American soldiers. The Vietnamese Office for Seeking Missing Persons was founded 45 years ago as a concession to American demands that Vietnam do more to account for the missing Americans before Washington would lift economic sanctions or consider war-recovery aid. The office claims to have helped find and repatriate 972 sets of American remains. It boasts of mobilizing thousands of staff members at the Vietnamese Office for Seeking Missing Persons, and tens of thousands of personnel from local authorities and citizens nationwide. The missing Vietnamese soldiers are hardly forgotten, though. The search for remains has become something of an obsession for the public. Remains-gathering stories are the subject of TV specials, postwar literature and local newspaper stories. “It’s just normal to us,” a Vietnamese friend remarked. One night, I started chatting with a taxi driver, Tuan, and found out that two of his uncles were killed in the war and listed as missing. The family had gone on multiple search trips, driving all day down to Quang Ngai province, to look for the bodies. They’d managed to find one set of remains, but the other, his uncle Thanh, was still missing. A few days later I visited Tuan at home to get the rest of the story from his mother and father, veterans themselves. Tuan’s mother, Minh, recounted the last search trip, when the family had come up short and been forced to drive back to Hanoi empty-handed. What will you do now? I asked. Minh stared at me for a second as if the answer was obvious. Reporting for this article was made possible by a grant from the Pulitzer Center on Crisis Reporting. Joseph Babcock teaches writing at the University of California, San Diego, and is working on a book about contemporary Vietnam.